One of many stained glass windows at First Baptist DC. I think this one depicts the woman with the discharge, who touched the hem of Jesus’ garment and was made well. My mistake, Rod tells me that this is “Mary and the Risen Christ,” right after the Resurrection. Jesus is depicted carrying a shovel, which causes Mary Magdalene (to whom Jesus was not married, by the way) to think he is the gardener. 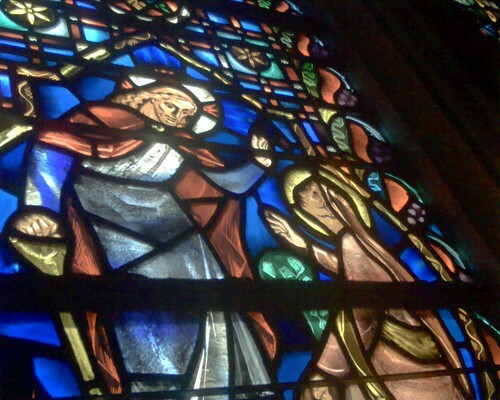 According to my Fodor’s Guide to First Baptist, that window is called “Mary and the Risen Christ.” Notice the shovel – she thinks he’s the gardener.